1. Click to reivew our "Flag Raising and Pass in Review" instructions. 2. Click to review "Drill Notes" and instructions. 3. Click to review a copy of the "FM22-5" book. 4. Click to review a copy of "The Platoon Guide". 5. Click to review "The Rifle Company Guide". 5. Click to review "The Basic Field Manual FM-21-100". Any military impression seen in the ETO, MTO and US are welcome. *For female military authenticity regulations, click here. Click to review instructions for laying out ones pack for inspection. Click to reivew 1942-1945 Official Army Uniform and Insignia Regulations. Uniforms and equipment must be original or quality reproductions. Please refrain from including in your display or wearing original or reproduction items that do not date to 1944 or earlier. As these are military uniforms of the respective countries, although no longer in use, they should be worn in a manner befitting a soldier of the time period. Shirts are to be worn and tucked in, cartridge belts and pistol belts are to be worn above the hip bones and packs are to ride high on the back. Uniforms should be complete and not mix grades of uniforms or insignia. Appropriate headwear should be worn for the circumstances. Hair must be cut to the military standards of the impression portrayed. Allied male troops should ensure that hair is cut off the ears and collar. Mustaches must be trimmed to the corners of the mouth. Other facial hair is not military and therefore, not permitted. For Allied troops planning to participate in the landing additional requirements apply. These are listed below. Wool Shirt and Pants, Garrison Cap = Class B without the tie or leggins. M42 Jump Set with Garrison Cap. Can put on fatigue wear if doing "fatigues" but would like everyone in wools in camp. (Parade consists of welcome and General Orders). After parade, company commanders get companies ready for battle rattle inspection. Class B w/ tie & overseas cap, leggings, M41 jacket. Includes Glider Parachute Infantry - M42 Jump Set, wool shirt, tie and garrison cap. HBT uniforms, M41 or USN variant and white sailor cap. For flag raising add helmet, web belt, bayonet and rifle (no packs). 1. Uniform For Operation Overlord. Uniforms should have the appropriate Divisions patch for unit portrayed, as well as Invasion Flags or Flag brassards. • Uniform For Operation Overlord. Uniforms should have the appropriate Divisions patch for unit portrayed, as well as Invasion Flags or Flag brassards. • Option: M-42 Jump suit Reinforced, for 101st extra pockets or modified jump suits are ok. For 82nd leg ties should be 82nd style, and no extra pockets. Also no jump suits should be painted unless portraying a pathfinder. 2. Appropriate web gear, can be worn in any combination appropriate for weapon carried. • Thompson Sub Machine Gun, Full Auto or Semi Auto. Must be in “Short Barrel” configuration. Any Airborne specific gear, that is appropriate for the Normandy Campaign is acceptable for use or display. I.E. PPN1 Eureka Beacons, A4 or A5 Drop Canisters, T5 Parachutes, etc. • Service shoes, or Rough outs and leggings. If Jump boots are worn must have leggings on. • Overseas cap with glider or combined airborne patch, with appropriate piping for impression. • M1 Helmet with Liner, may wear helmet net with scrim, and clover identification for those portraying the 327th. No markings for the 325th. • 1923 Cartridge belt, Bar Belt, or pistol belt with appropriate pouches for weapon used. Reenactors representing Allied forces on D-Day are welcome to land on the beach via the landing craft. US infantry that assaulted the beach comprised the 1st, 4th, and 29th Infantry Divisions, the 2nd and 5th Rangers, and the Naval Beach Battalions. If you plan to portray one of these divisions and are not currently a member of the divisions, we ask that you coordinate with and fall in under the respective unit commanders. The requirements for these divisions have been developed by their respective unit commanders. Those wishing to portray a “generic” impressions, see Generic US Infantry below. 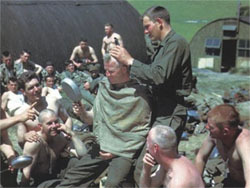 Hair must be cut to the military standards of the U.S. Army in 1944. This means that sideburns are not below the corner of the eye and the hair is off of the ears and collar. The modern “High and Tight” is NOT CORRECT. Mustaches must be trimmed to the corners of the mouth. Other facial hair is not military and therefore, not permitted. The picture below shows several examples of hairstyles. The man bottom left has a longer cut, the men back center have the same style. The men in the foreground have their heads shaved. • Assault Jackets are to be worn by NCOs and Officers only. These were distributed in very small numbers and most pictures show NCOs and Officers with them. • Gas Masks should be worn on the chest and not on the leg. These should be the black rubberized waterproof gas mask bag. • M-1 Helmets can have netting. This has been written about and is seen in photos. I would prefer the small hole nets, however both styles have been seen in photos of both the 2nd and 5th Rangers. We have written accounts of men of 5 D tying ABN Med pouches and TNT to their helmet nets. • Neck Ties. Yes that right, a neck tie, wool khaki mohair neck tie. This is for the Class B uniform which will be worn for morning formations each day. If you forget your tie one will be signed out to you from supply and then returned to supply at the end of the weekend. • You can have Type II Service shoes with Leggings. Again there are pictures of these. What there are none of are Double Buckle Boots. So those will NOT pass S&A. Also Zipper Type Jump Boots will not be worn. • Firearms will be that which the Rangers would have been able to draw from supply. M1 Garand, 1903 Springfield, M1 Carbine, M1 Thompson, 03A4, 1919, BAR, Bazooka, and the 60 mm Mortar. What will NOT pass S&A are Axis Weapons, so please leave the Mauser at home. If you DO NOT own a firearm and no one in your unit has one to lend please come to the Battalion HQ and we will get you squared away. • No Scroll Patches on the shirts or jackets. These were not available to the 5th and 2nd Rangers until long after the Normandy Campaign, so please keep them off of the uniforms that will be worn in the field. This impression requires that you help with the landing craft and troop disembarkation as your primary function. On shore signaling, hydrographic (determination of landing zones), mock demolition and first aid; safety at the waters edge is your honor and duty. Demolition and medical teams are to limit their advance to the initial dunes and then may proceed to accompany Army ground forces from the second wave and beyond. Signaling and Hydrographic sections will land first, guide in the landing crafts and then may go inland to assist in the infantry assault after ALL the assault troops have disembarked. • Shirt or Army Coveralls (preferred for 6th Naval Beach Battalion) - HBT; plain white undershirt or Little Creek Va T., 7th Beach Battalion sailors wore wool shirts with HBT trousers. • Boots, Parachutist, blouse HBT trousers or coveralls into boots. Other "approved" footwear at unit commanders discretion. • M-1 Helmet with or without netting, Rainbow Arc, Pale Blue/Grey Band, (Model master FS36118, playing card width) and additional detail of a stenciled name or USN varies pending NBB platoon represented, contact Eric Montgomery, 6th Naval Beach Battalion (stitch@ddayohio.us) for information or Coleman Adamec, 7th Naval Beach Battalion (7thnbbny@gmail.com) on painting the helmets correctly. • Cartridge Belt/Pouch per carried weapon, M1 Carbine, M1903, M1919a4 Thompson Machine Gun (Section Leaders) or M1 Garand. 1919 45 Automatic pistol for officers permissible. • M1928 Field Pack with either variant of entrenching shovel unless carrying specialty equipment such as signal lights, maps, flags and/or radios. • HBT's with M41 or USN N4 variant weather permitting and white sailor cap. For flag raising add helmet, web belt, bayonet and rifle (no packs). If you choose to portray a division or not specifically listed, you may conform to one of the above listed standards, or you may use the Generic US Infantry requirements as below: All uniforms, equipment and weapons must be original or authentic reproductions. • Undershirt, Cotton – Either a period style Tank-Top, or T-Shirt. We request that participants refrain from using Modern US Army Brown T-Shirts. Tea died t-shirts are acceptable! • HBT Jacket and M1941 Jacket, or HBT Jacket over Wool Shirt – We request that participants refrain from using M1943 Field Jackets. We also request that Wool Service Shirts are worn under HBT Jackets at minimum. • Pack, M1928 or Suspenders M1936 and Musette Bag – Packs must have contents in them, whether they be authentic or lightweight filler. • Light Weight Gasmask Bag (3-snap gasmask bag) or Assault Gasmask bag– We request that participants refrain from using “Kidney” gas mask bags. • Edged weapon appropriate for role or weapon carried. All weapons to be used in the battle will be inspected for proper installation and condition of a Blank Firing Adapters prior to the participant being allowed to depart the company area. • ## Shotguns are not allowed for use in the battle. • M3 & M3a1 “Grease Guns” are not allowed for use in the battle. 16 inch barrel Semi-Auto M3a1 “Grease Guns” are not allowed for use in the battle or for display. • 1919a6 Light Machine Guns are not allowed for use in the battle. "A4" Configurations are allowed for use in the battle. • No "Civilian" or "Captured" weapons are to be used in the battle. • All "Machine Gun Simulators" or "Weapons Simulators" will be approved on a case by case basis. • The Authenticity & Safety officer reserves the right to deny any weapon from being used in the battle at his discretion. Other forces, such as Parachute Infantry, etc., must obtain and change into a correct uniform and kit to abide by the Generic US Infantry requirements or any of the other specifically listed group requirements if they wish to participate in the beach landing. We know the Normandy Invasion involved a lot of paratroopers in the early morning hours, and have added the Battle for the Bridge and The Road to Victory scenario to honor the heroics of Airborne Troopers. We've appreciated the supportive attendance and enthusiastic participation of all at our past events. So if you have two impressions (one Airborne/other and one D-Day Amphibious correct) and want to portray both, have at it! If you would like to portray Airborne only, fine too! We want every one to have a good time and enjoy themselves. Check out the links on the main page for details of all the battle scenarios. All Allied forces historically accurate for D-Day (i.e., those that amphibiously assaulted any of the five Normandy beaches on 6/6/1944) are welcome to land on the beach via the landing craft. Exceptions: Unit Insignia. If your unit portrays an ETO combat unit of the same type as a D-Day unit (e.g., you represent a US Infantry unit who saw action in the ETO but you're not 1st ID, 29th ID, 4th ID, 2nd Rangers, 5th Rangers, Army Special Engineer Brigades (Blue Patch), or Beach Battalions (Red Patch), and you can get the rest of the assault infantry kit together that would be accurate for one of the historically correct D-Day amphibious assault units and can pass for one, you may land with the rest. Please swap your shoulder sleeve insignia to one of the historically correct units for the beach landing, we (and everyone else with a camera) would appreciate it, but we won't mandate it. One solution is to wear the gas brassard over the shoulder sleeve insignia. Look sharp GI Joe, Veterans are watching as well as thousands of cameras!